Weber are a company that is constantly focusing on creating new technology, that makes grills cook better tasting food. However, their Kettle Grill design has been near perfect for some time now, so when, in the build up to the Weber 14401001’s release, they started boasting about brand new improvements, I was slightly taken aback. What could they have possibly done to make the Kettle Grill better? I got my hands on one, to put it through a few tests, and the following Weber 14401001 Review is my account of the improvements, and how they relate to the overall performance of the grill. I’m being unfair but they could have gone all the way with the cooking surface making it the largest in the industry. Assembly was completed in under 10 minutes, giving the Weber 14401001 one of the shortest assembly times of grills currently on the market. All buyers really need to do is connect a few parts using the easy to understand instructions. As far as cooking experience, goes Weber have done amazingly here. The grates are exceptional, but that’s something one would expect from a Weber product. What sends these grates into orbit, is how they are designed using hinges and this is a stroke of genius. Many buyers will have encountered the problem of needing to put more charcoal in the grill after they’ve started cooking. What follows is the rather annoying task of taking the meat off the grill, while this can be done. With the 14401001 all purchasers need to do is lift up the hinged grates slightly and slot more charcoal in. I’ve never seen this before, but it’s a genius solution to an age old problem experienced at one time or another, by every grill enthusiast. The cooking surface is 363 square inches, which is the same as the 15501001, and they’ve also taken the bowl from the 15501001. This is classic Weber; recognizing what’s good in a model and keeping it, while changing everything else. The old Weber Grills where amazing, but had a few flaws. Here, the handle has been fixed so it doesn’t rust, the legs, once unsteady, are now held together in a sturdy fashion by push-pins. Interestingly the thermometer and vents are now on opposite sides so the heat readings are more accurate, and the ash-catcher lets no drips through. Two things they’ve kept the same as in other models, are the ignition, which is Weber’s usual and very efficient one-touch system, and the same porcelain coating has been used for ease of cleaning. 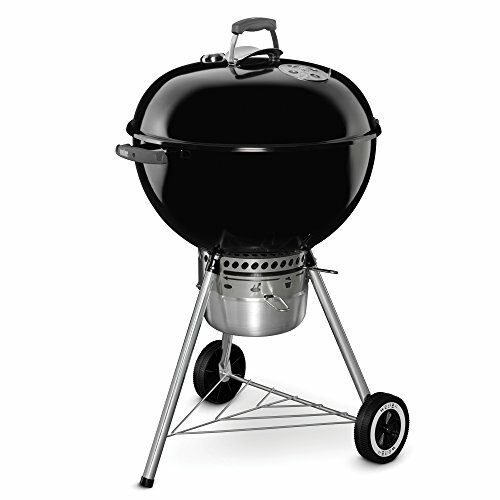 Weber are a fantastic brand, and are currently the number 1 brand of grill manufacturer in the world. They’ve achieved this by constantly perfecting performance to reach more buyers. The Weber 14401001 Original Kettle Premium Charcoal Grill is simple enough to first time grillers to use, yet advanced enough for experts to enjoy. They’ve gone through all the other Weber models looking for slight flaws that they could improve upon, and amazingly they found some and fixed them all. The design uses high quality materials so will last a long time, making this a grill, I can highly recommend.